The trick, to always packing a healthy lunch quickly, is to make sure you always have a supply of quick prep things available. My two favorites are sprouts and frozen mixed veggies. 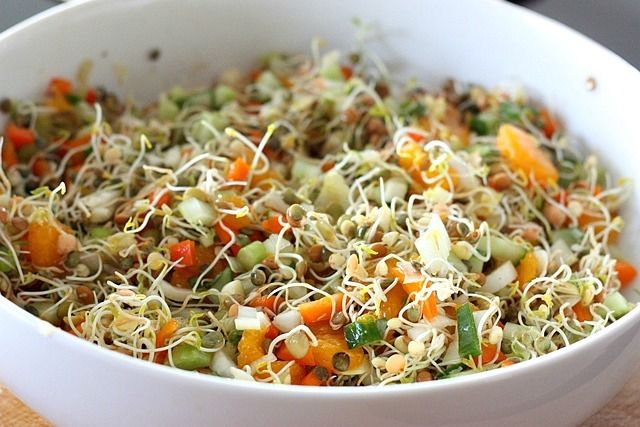 I always have a supply of sprouts (click here to see how easy it is to make your own) … well almost always, and mixed veggies … always in my freezer. What I do is, just steam the mixed veggies the night before, mix that in a lunch box with a handful of sprouts, add sunflower seeds, sesame seeds, pumpkin seeds, whatever I remember I have, and then pack in 2 boiled eggs, and an avo separate with that. Drizzle over some olive oil, and a teeny bit of salt. Pack a knife and spoon 🙂 Eggs I have with some of the mixed veg and sprouts for brunch and the rest for lunch! Yay for 5 meals per day!